A DOE ruling known as the Regional Standards has set the minimum efficiency on furnaces at 90% AFUE as of May 1, 2013 for the state of Colorado located in the North Standard Zone. As of December 2012 the ruling is under challenge by various organizations. 1. The energy efficiency standard for residential gas furnaces in the Northern Region has been remanded. The Department of Energy (DOE) will begin the process of assessing a new standard and has agreed to use a more transparent process. It is likely that a new furnace standard will not be established until 2021-2022. Until a new standard is established, a national standard of 80% AFUE is the law of the land. 2. On January 1, 2015 the efficiency standard for central air-conditioners in the South will be 14-SEER. 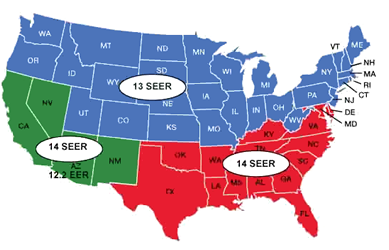 In the Southwest, that standard will be 14-SEER 14 SEER and 12.2 EER for systems smaller than 45,000 Btu, and 14 SEER and 11.7 EER for systems larger than 45,000 Btu. 3. Distributors in the South and Southwest will have 18 months (July 1, 2016) to sell any inventory of 13-SEER equipment manufactured before January 1, 2015. 4. DOE has agreed not to assess civil penalty upon distributors for violations related to the enforcement of regional efficiency standards for central air-conditioners and heat pumps. 5. DOE will present a proposal for a negotiated rulemaking regarding the enforcement of the regional standard to the Appliance Standards and Rulemaking Federal Advisory Committee (ASRAC). If approved by ASRAC, DOE will attempt to use a negotiated rulemaking as a means to determine an effective enforcement scheme by engaging all interested parties, gathering data, and attempting to reach consensus amongst all stakeholders. 6. DOE agrees to evaluate and assess the usage of the Direct Final Rule process, which was used to establish the Regional Efficiency Standards and was the focus of the lawsuit challenging the standards. With this ruling, the court is preventing the U.S. Department of Energy (DOE) from applying or enforcing the standards until the underlying lawsuit between the DOE and the American Public Gas Association (APGA) is resolved. The case could last into 2014 without a ruling. May 1, 2013 - a Motion to Stay has been grated by the US Court of Appeals. This morning, an emergency Motion to Stay was granted by a U.S. Court of Appeals in the ongoing Regional Standards lawsuit. This motion legally forbids the Department of Energy (DOE) from enforcing the furnace standard in the Northern Region, which was to take effect today, while legal efforts continue. Previously, DOE had stated they would not enforce the standard on the effective date (May 1) via a policy statement, leaving open the slim possibility that DOE could change their minds and begin enforcing the standard. This Motion to Stay removes all doubt and should provide a greater level of certainty for distributors as they continue to make decisions regarding their inventory. Additionally, the Motion states that if the Court were to decide that the standard should be upheld, there would be a six month delay before DOE could begin enforcing the standard. April 5, 2013 - DOE will not enforce the Regional Standard in the Northern Region while the proposed settlment and other matters are pending before the court. April 5, 2013 - The Department of Energy released a statement this afternoon stating that while litigation was ongoing in the Regional Standards lawsuit and the court was considering a proposed settlement as well as a motion to stay, the DOE will not enforce the Regional Efficiency Standard in the Northern Region. DOE stated: "In an exercise of its enforcement discretion, DOE will, during the pendency of the litigation, act in a manner consistent with the terms of the settlement agreement with regard to the enforcement of the standards." DOE's policy statement comes on the heels of multiple requests for a delay from the Department. Today alone, HARDI members sent nearly 900 emails to the DOE and Capitol Hill requesting this very action. In less than 40 days the May 1 compliance date for the Regional Efficiency Standards for residential gas furnaces in the Northern Region takes effect. Because of the proximity of this date, conflicting accounts of what is exactly happening and uncertainty regarding the legal case surrounding the standard, the objective of this email is to outline what is happening with this issue. Public Gas Association (APGA) and the Department of Energy (DOE) filed a proposed settlement with the U.S. Court of Appeals. This settlement would vacate the residential gas furnace and mobile home gas furnace standards, which carried a May 1, 2013 effective date. The DOE would then be forced to redo the furnace standard. This proposed settlement does not address the regional efficiency standards for central air-conditioning, which take effect in the South and Southwest on January 1, 2015. The court must officially approve or reject this proposed settlement. Substitution with the Court. This motion stated that HARDI did not object to the proposed APGA/DOE settlement, however if the court accepts the settlement HARDI would like to continue the case to address procedural issues, which led to the development of the regional standard for central air-conditioning in the South and Southwest. Consumer Federation of America, Natural Resources Defense Council, Alliance to Save Energy and the American Council for an Energy-Efficient Economy filed an opposition to the proposed APGA/DOE settlement. effective date. To date, the DOE has failed to respond or acknowledge these requests. date, a motion was filed with U.S. Court of Appeals to request a stay or delay from the May 1 effective date for the Regional Efficiency Standards in the Northern Region. The motion, which was filed by the Air-Conditioning, Heating & Refrigeration Institute (AHRI) echoes comments presented to the court by HARDI regarding the uncertainty that this looming deadline has brought upon the entire HVACR industry. HARDI and ACCA will be filing a response in support of the motion to stay or delay the deadline. To reiterate, a settlement has been proposed regarding regional efficiency standards for residential gas furnaces in the Northern Region, but as of today the court has yet to accept this settlement. There is no timetable for when the court may rule on both the APGA/DOE settlement or HARDI's motion to continue on with the lawsuit to address other items if the settlement is accepted. Because of uncertainty regarding the proximity of the May 1 compliance date, AHRI has filed a motion to stay or delay the effective date and both HARDI and ACCA will be filing a supportive response. Until the motion to stay is granted or the court accepts the proposed settlement, the May 1 effective date is still the law of the land. HARDI will continue to keep members updated as developments occur. March 8, 2013 - AHRI requests delay in compliance date for Regional Furnace Standards. The May 1, 2013 ruling is still in place. February 1, 2013 - HARDI files motion to continue Regional Standards lawsuit. January 11, 2013 - HARDI - Late this afternoon, the American Public Gas Association (APGA) and the Department of Energy (DOE) filed a settlement agreement with the court in the ongoing lawsuit over Regional Efficiency Standards. Intervening parties in the lawsuit (including HARDI) now have ten days to file a response with the court, after which time the court will accept or reject the settlement agreement. The terms of the settlment would vacate the current non-weatherized gas furnace and mobile home gas furnace standards, which were to be effective on May 1, 2013, and begin the process for developing a new standard within a year of the finalization of the settlement agreement. The DOE has agreed to amend some of its data collection and information sharing procedures for this rulemaking. This settlment agreement does not impact the Regional Efficiency Standard for Central A/C, nor does it provide any guarantee that a similar Regional Standard for these products may not again be set by the DOE in the subsequent rulemaking. Rather, the settlement means that the DOE would essentially hit reset on the portion of the rule covering residential gas furnaces and mobile home gas furnaces. It is unclear how this settlment will impact an enforcement rulemaking, which was to be completed by DOE later this month and has yet to begin. January 3, 2013 - ACHR News - The lawsuit is still in mediation and under a gag order. A status report will be filed on January 14, 2013. At this time Contractors, Manufacturers, and Distributors are to assume nothing has changed and the May 1, 2013 will remain in place. December 13, 2012 - The mediation process was still ongoing and an additional status report will be presented to the Court by January 14, 2013. Despite unsubstantiated reports, no settlement has been reached. If a settlement is reached between the two principal parties, it would then have to be accepted by the Court. Due to a mandated gag-order on mediation discussions, HARDI is not able to provide details of this mediation and any reported details or comments, because they cannot be confirmed or denied, should be treated as conjecture. Until a settlement is reached and approved by the Court or the case resumes through the court system and a judgment is delivered, distributors in the Northern Region must still prepare for a May 1, 2013 compliance date for non-weatherized and mobile home gas furnaces. HARDI will continue to provide membership with updates and breaking news as it happens. As we learn of more information we will post it.